History buffs of all ages are invited to experience an authentic colonial market fair at Fort Frederick State Park April 25-28. 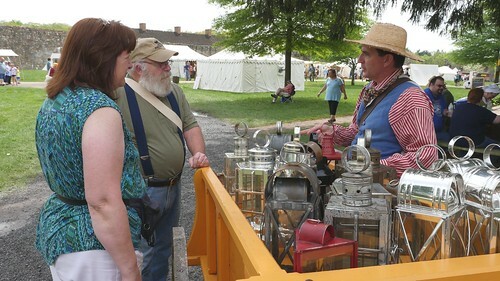 The annual Fort Frederick Market Fair features top artisans, craftspeople, entertainers and sutlers together with an 18th century military encampment alongside the park’s historic 1756 stone fort. See hundreds of re-enactors and sutlers selling delicious food and 18th century wares, including paintings and prints, clothing, patterns, material, books, camp gear, muskets and accoutrements, hornware, fireplace and cooking hardware, lanterns, tinware, copperware and pottery. The park offers free entertainment throughout the event, plus a fundraising auction on Saturday to benefit the Friends of Fort Frederick State Park, which co-hosts the event. Hours for the event are 9 a.m. to 5 p.m. Thursday through Saturday and 9 a.m. to 3 p.m on Sunday. Admission is $5 for adults, $2 for children ages 6-12, and free for children 5 and under. More information is available by calling the park at 301-842-215 or at the Friends of Fort Frederick website.